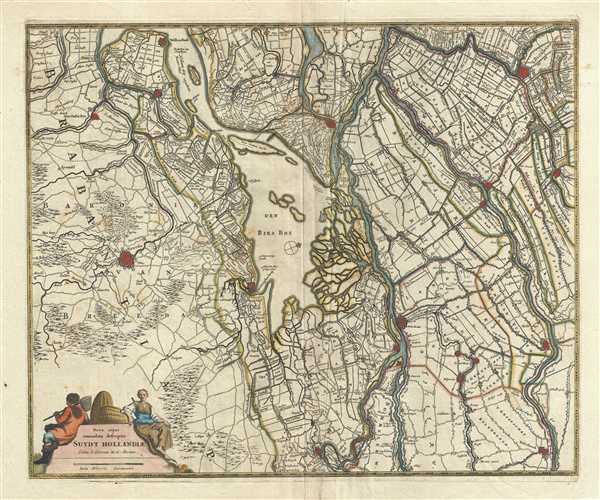 Detailed map of southern Netherlands dating to the early 18th century. Nova atque emendata descriptio Suydt Hollandiae. This is a beautiful c.1721 map of southern Holland or the Netherlands by Frederik De Wit. Oriented with north facing northwest, it extends from Gouda south to Breda and from Willemstad east as far as Culemborg. Important cities of Dordrecht, Gorinchem, Breda, Gouda, Willemstad etc., are identified. The map is superbly detailed, offering both topographical and political information, including roads, lakes, rivers, canals, windmills, churches, etc., with mountains beautifully rendered in profile. An elegant title cartouche is featured in the bottom left quadrant. The map was issued by Covens and Mortier and printed shortly following their 1721 acquisition of De Wit's plates from Maria De Wit. Very good. Minor wear and verso repair near original centerfold. Some spotting.